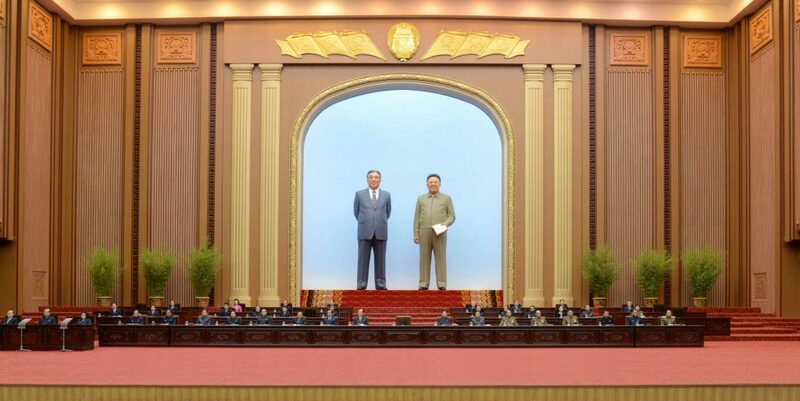 View of the platform at Mansudae Assembly Hall in Pyongyang during the sixth session of the 13th Supreme People’s Assembly on April 11, 2018 (Photo: Rodong Sinmun). 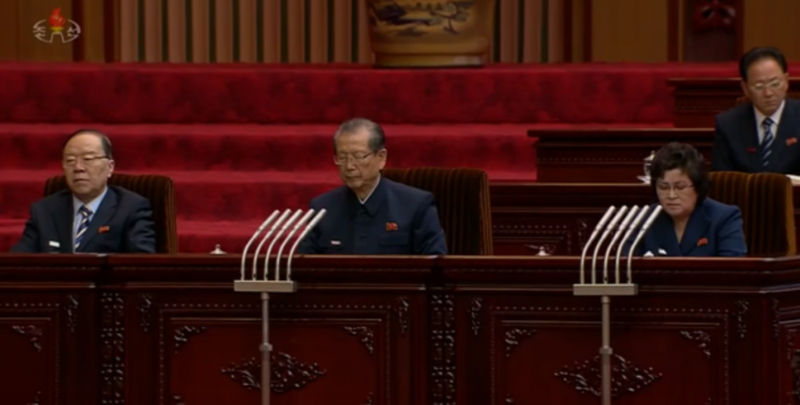 The sixth session of the 13th Supreme People’s Assembly [SPA] was held at Mansudae Assembly Hall on April 11 (Wednesday). On the agenda were reports about the DPRK state budgets for 2017 and 2018, a reports about activities of the DPRK Government and the domestic economy, and some personnel matters. 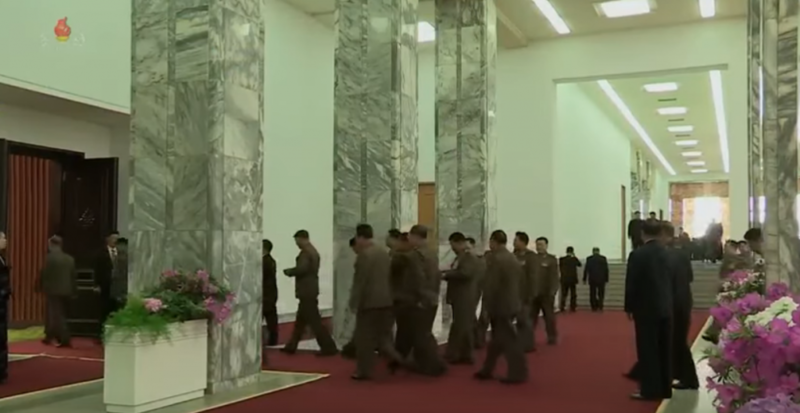 WPK Vice Chairman and Propaganda and Agitation Department Director Pak Kwang Ho, Chief of the KPA General Staff VMar Ri Myong Su, KPA General Political Department Director VMar Kim Jong Gak and other senior party and army officials arrive at the Mansudae Assembly Hall prior to the 6th session of the 13th SPA on April 11, 2018 (Photo: KCTV). 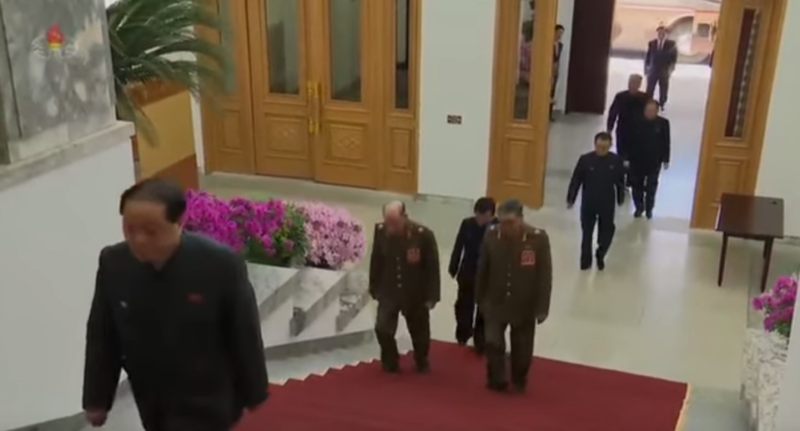 KPA high command and corps commanders enter the SPA chamber on April 11, 2018 (Photo: KCTV). Former WPK Vice Chairman and former WPK Finance and Planning Department Director Kwak Pom Gi smiles as he arrives for the SPA session. Also in this photo are WPK Organization Guidance Department Senior Deputy Director Kim Kyong Ok, WPK Agriculture Department Director Ri Chol Man and WPK Workers’ and Social Organizations Department Director Ri Il Hwan (Photo: KCTV). Sitting on the platform was SPA Chairman (speaker) Choe Thae Bok (Ch’oe T’ae-pok) and deputy chairs An Tong Chun (An Tong-ch’un) and Ri Hye Jong (Ri Hye-cho’ng) and members of the SPA Presidium (standing committee) including: SPA Presidium President Kim Yong Nam (Kim Yo’ng-nam), SPA Presidium Vice President Yang Hyong Sop (Yang Hyo’ng-sop), SPA Presidium Vice President and Chairman of the Korea Social Democratic Party Central Committee Kim Yong Dae (Kim Yo’ng-tae), Honorary SPA Presidium Vice President Choe Yong Rim (Ch’oe Yo’ng-rim), Women’s Union Central Committee Chair Jang Chun Sil (Chang Chun-sil), Democratic Front for the Reunification of the Fatherland Presidium Member Pak Myong Chol (Pak Myo’ng-ch’o’l), WPK Vice Chairman and WPK United Front Department Director Kim Yong Chol (Kim Yo’ng-ch’o’l), Kang Myong Chol (Kang Myo’ng-ch’o’l), Pyongyang WPK City Committee Chairman Kim Su Gil (Kim Su-kil), Kang Su Rin, Union of Agricultural Workers of Korea Central Committee Chairman Kim Chang Yop (Kim Ch’ang-yop) and General Federation of Trade Unions of Korea Central Committee Chairman Ju Yong Guk (Chu Yo’ng-kuk). SPA Chairman Choe Thae Bok (center) with SPA Vice Chairs An Tong Chun (left) and Ri Hye Song (right) (Photo: KCTV). Also sitting on the platform were other members of the central leadership: Personal Secretariat deputy chief and WPK Propaganda and Agitation Department Senior Deputy Director Kim Yo Jong (Kim Yo’-cho’ng), WPK Vice Chairman and State Affairs Commission Vice Chairman Choe Ryong Hae (Ch’oe Ryong-hae), DPRK Premier and State Affairs Commission Vice Chairman Pak Pong Ju (Pak Pong-chu), Korean People’s Army [KPA] General Political Department Director VMar Kim Jong Gak (Kim Cho’ng-kak), WPK Vice Chairman and WPK Propaganda and Agitation Department Director Pak Kwang Ho (Pak Kwang-ho), Chief of the KPA General Staff VMar Ri Myong Su (Ri Myo’ng-su), Minister of the People’s Armed Forces Gen. Pak Yong Sik (Pak Yo’ng-sik), SPA Diplomatic Committee Chairman and WPK International Affairs Department Director Ri Su Yong (Ri Su-yo’ng), WPK Vice Chairman and WPK Cadres’ Affairs Department Director Kim Phyong Hae (Kim P’yo’ng-hae), Minister of People’s Security Gen. Choe Pu Il (Ch’oe Pu-il), Minister of State Security Col. Gen. Jong Kyong Thaek (Cho’ng Kyo’ng-t’aek), WPK Vice Chairman Pak Thae Song (Pak T’ae-so’ng), WPK Vice Chairman and WPK Economic Affairs Department Director O Su Yong (O Su-yo’ng), WPK Vice Chairman and WPK Munitions Industry Department Director Thae Jong Su (T’ae Cho’ng-su), WPK Vice Chairman and WPK Light Industry Department Director An Jong Su (An Cho’ng-su), DPRK Vice Premier and State Planning Commission Chairman Ro Tu Chol (Ro Tu-ch’o’l), DPRK Vice Premier Im Chol Ung (Im Ch’o’l-u’ng), WPK Inspection [Control] Commission Chairman Jo Yon Jun (Cho Yo’n-chun), WPK Vice Chairman Pak Thae Dok (Pak T’ae-tok), WPK Organization Guidance Department Senior Deputy Director Ri Man Gon (Ri Man-ko’n), WPK Munitions Industry Department Senior Deputy Director and KPA Operations Command Group chief Ri Pyong Chol (Ri Pyo’ng-ch’o’l), WPK Vice Chairman Choe Hwi (Ch’oe Hwi), North P’yo’ngan WPK Provincial Committee Chairman Kim Nung O (Kim Nu’ng-o) and Second Economy Commission [Second Economic Committee] Chairman No Kwang Chol (No Kwang-ch’o’l). 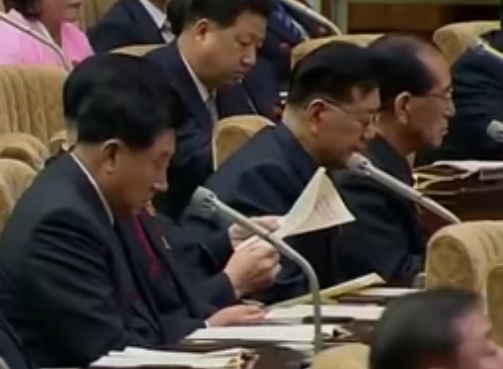 Kim Yo Jong (second row, right) at the sixth session of the 13th SPA. Also in this photo are WPK Organization Guidance Department Senior Deputy Director Ri Man Gon (second row, left), Chief of the KPA General Staff VMar Ri Myong Su (first row, left) and Minister of the People’s Armed Forces Gen. Pak Yong Sik (Photo: KCTV). Senior DPRK officials on the SPA platform: WPK Vice Chairman Pak Thae Song (first row, left), Minister of People’s Security Gen. Choe Pu Il (first row, right), Minister of State Security Col. Gen. Jong Kyong Thae (second row) and Democratic Front for the Reunification of the Fatherland Presidium Member Pak Myong Chol (third row) (Photo: KCTV). Also in attendance were SPA deputies (members), senior KPA and internal security services officials and attending as observers were various DPRK Government officials, factory and production unit managers and leading officials of education and research institutions. Some of the more prominent SPA deputies and observers included: Chairwoman of the Committee for Cultural Relations with Foreign Countries and former Minju Joson editor Kim Jong Suk (Kim Cho’ng-suk), Guard Command Director Gen. Yun Jong Rin (Yun Cho’ng-rin), KPA Artillery Command Director and Vice Chief of the KPA General Staff Col. Gen. Pak Jong Chon (Pak Cho’ng-chon), Vice Chief of the KPA General Staff Gen. O Kum Chol (O Kum-ch’o’l), KPA Navy Commander VAdm Kim Myong Sik (Kim Myo’ng-sik), Guard Command Political Director and Vice Commander Col. Gen. Kim Song Dok (Kim So’ng-tok), WPK Organization Guidance Department Senior Deputy Director Kim Kyong Ok (Kim Kyo’ng-ok), WPK Organization Guidance Department Senior Deputy Director and former KPA General Political Department Director Hwang Pyong So (Hwang Pyo’ng-so’), former WPK Vice Chairman and former WPK Propaganda and Agitation Department Director Kim Ki Nam (Kim Ki-nam), WPK Munitions Industry Department Deputy Director and Atomic Weapons Institute chief Ri Hong Sop (Ri Hong-sop), State Academy of Sciences President Jang Chol (Jang Ch’o’l), State Affairs Commission Department Director Kim Ung Chol (Kim U’ng-ch’o’l), Minister of Culture Pak Chun Nam (Pak Ch’un-nam), former WPK Munitions Industry Department boss Pak To Chun (Pak To’-chun), WPK Finance and Accounting Department Director Kim Yong Su (Kim Yo’ng-su), former WPK Vice Chairman and former WPK Finance and Planning Department Director Kwak Pom Gi (Kwak Pom-ki), former Second Economy Commission Chairman Jo Chun Ryong (Cho Ch’un-ryong), Namp’o WPK City Committee Chairman Kang Yang Mo (Kang Yang-mo), former Second Academy of Natural Sciences President Choe Chun Sik (Ch’oe Chun-sik), Rodong Sinmun editor Kim Pyong Ho (Kim Pyo’ng-ho), Worker-Peasant Red Guard Commander and WPK Military Affairs Department Director Ri Yong Rae (Ri Yo’ng-rae), WPK Munitions Industry Department Deputy Director Hong Sung Mu (Hong Su’ng-mu), WPK Munitions Industry Department Deputy Director Hong Yong Chil (Hong Yo’ng-ch’il), Raso’n WPK City Committee Chairman Rim Kyong Man (Rim Kyo’ng-man), Kim Tong Gyu (Kim To’ng-kyu), WPK Munitions Industry Department Deputy Director Yu Jin (Yu Chin), former Minister of Finance and former SPA Presidium Member Kim Wan Su (Kim Wan-su) and former WPK Propaganda and Agitation Senior Deputy Director Ri Jae Il (Ri Ch’ae-il). 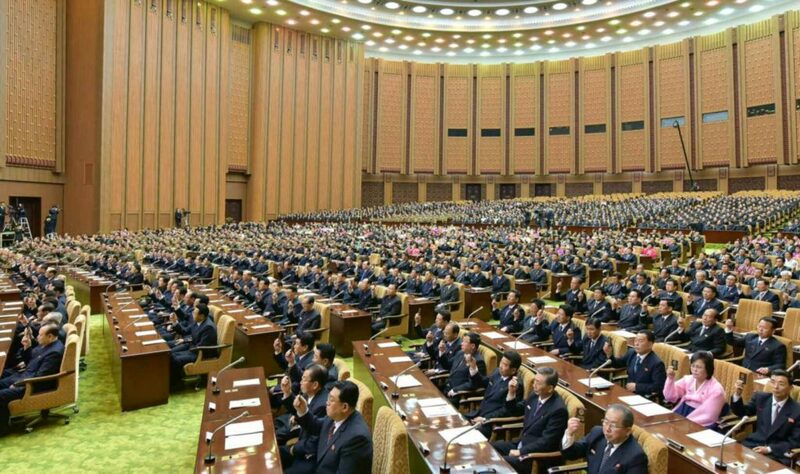 View of SPA deputies attending the 13th SPA’s sixth session on April 11, 2018 (Photo: KCNA/Rodong Sinmun). 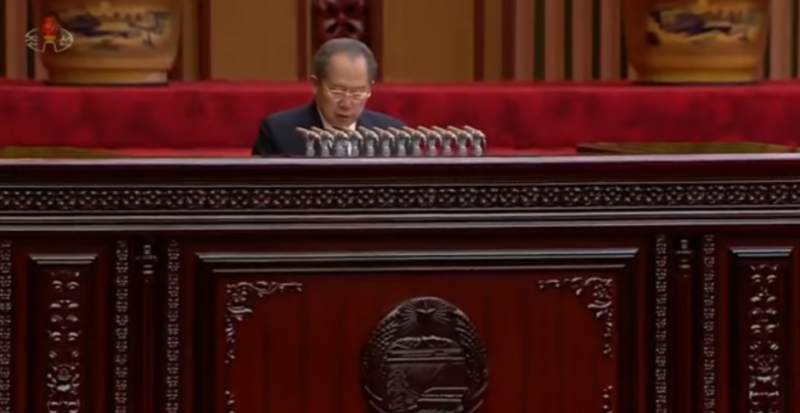 SPA Presidium President Kim Yong Nam reads a report during the sixth session of the 13th SPA on April 11, 2018 (Photo: KCTV). DPRK Premier and State Affairs Commission Vice Chairman Pak Pong Ju reads out a report about the activities of the DPRK Government and the development of the country’s economy during the sixth session of the 13th SPA on April 11, 2018 (Photo: Rodong Sinmun/KCNA). Last year was a year of great victory in which a great progress had been made in carrying out the five-year strategy for the national economic development under the outstanding and seasoned guidance of the respected Supreme Leader Kim Jong Un, repelling unprecedentedly grave challenges stemming our advance. Last year the Cabinet organized a drive for putting the nation’s overall economy on a higher stage with a main emphasis put on revitalizing the production by locally producing equipment, raw and other materials on the principle of self-support and self-sufficiency while focusing the state efforts on augmenting the foundation for electricity production, rounding off the system of Chuch’e iron production and realizing the independence of chemical industry in line with the five-year strategy for national economic development set forth by the Party. All sectors and units of the national economy carried out a high-pitched drive for creation in the spirit of self-development and, as a result, lots of factories and enterprises honored their yearly gross industrial output value plans and those units associated with the leadership feats of our Party carried out their yearly national economy assignments. The achievements made last year, a year of crucial importance in carrying out the five-year strategy for national economic development, proved once again that no desperate sanctions and pressure moves of the US and its vassal forces to destroy the sovereignty of the DPRK and its rights to existence and development can ever check the progress of the Korean people dynamically advancing with firm faith in the validity of their cause and its final victory under the wise guidance of the Party and that the cause of building a powerful socialist country is sure to be accomplished. The fighting goals for the third year of the five-year strategy for national economic development should be attained without fail with a firm hold on the key tasks of strengthening the independence and Chuch’e character of the national economy and improving the standard of people’s living. The power industrial sector should put defective generation equipment into good shape and reinforce them, take scientific and technological measures for lowering the standard of coal consumption at thermal power plants and put the operation of the generation equipment additionally established in the Pukch’ang Thermal Power Complex on normal track and thus increase the electricity production with the use of thermal power source onto a high stage. The coal industrial field should attain the monthly and quarterly coal production goals and create more coal fields so as to fully meet the demand for coal increasing in different sectors of the national economy. In the field of metal industry, Korean-style Chuch’e-based iron making production system should be further perfected by the use of oxygen heat blast furnace and efforts be put into improving the quality of steel and diversifying the kinds of steels through introduction of advanced technologies so as to fully meet the demand for iron and steel of the national economy. The field of chemical industry should unconditionally hit the fertilizer production target to timely provide nitrogenous fertilizer to the agricultural field ahead of farming processes. The production at the February 8 Vinalon Complex should be invigorated to fully supply various chemical products including vinalon, caustic soda and vinyl chloride to various sectors of the national economy. Along with the establishment of various catalyst production bases, the construction of main production processes should be pushed forward at the Sunch’o’n Phosphate Fertilizer Factory and the process for production of carbonate of soda with glauberite as starting raw material should be renovated and perfected. The machine industrial sector has to step up the modernization of machine factories, unconditionally hit the target for production of tractors and trucks and put the quality of machinery on the world level. Advanced mining methods should be widely introduced to increase the production of minerals and nonferrous metal. The railway transport sector should ensure in a responsible manner the transportation of materials necessary for various sectors of the national economy and capital construction projects. The Cabinet will bring about a remarkable turn in improving the standard of people’s living through production surge in the fields of light industry, agriculture and fisheries. Equipment and production processes should be rearranged on a manpower-saving and electricity-saving basis, diverse and quality light industrial goods produced on a larger quantity with locally available raw and other materials, and local economy should be developed in a peculiar way with reliance on the domestic resources. High-yielding farming methods should be positively introduced and the proportion of farm work done by machines should be drastically increased to attain the grain production goal for this year without fail. The fisheries field should unconditionally hit the fish production target and at the same time finish the construction of projects for consolidating the material and technical foundation of fisheries ahead of schedule. Big efforts should be directed to sprucing up Samjiyo’n County into a standard and model county under socialism and the construction of the Wo’nsan-Kalma coastal tourist area should be finished within specified date. And such capital construction projects as the Tanch’o’n Power Station and the second-phase waterway project in South Hwanghae Province should be pushed forward. The more than 90 percentage rate of rooting of saplings should be ensured through planting of trees and good manuring and cultivation of planted trees and the appearance of the country be bettered through the technical renovation and repairing of highways and tourist roads in a qualitative way and the rearrangement of key rivers and streams based on an all-people movement. All fields and units should solve scientific and technological problems arising in completing the domestic production of materials and equipment and structure of the self-supporting economy by keeping up science and technology. The Cabinet and other state economic guidance organs will work out in a practical way an operation plan for hitting this year’s targets and push forward its implementation in a responsible manner through skillful operation and command to successfully attain the fighting goals set forth by the Party and thus fully discharge their responsibility and duty in glorifying this year marking the 70th anniversary of the DPRK as a year of victory to be specially recorded in the history of the country. 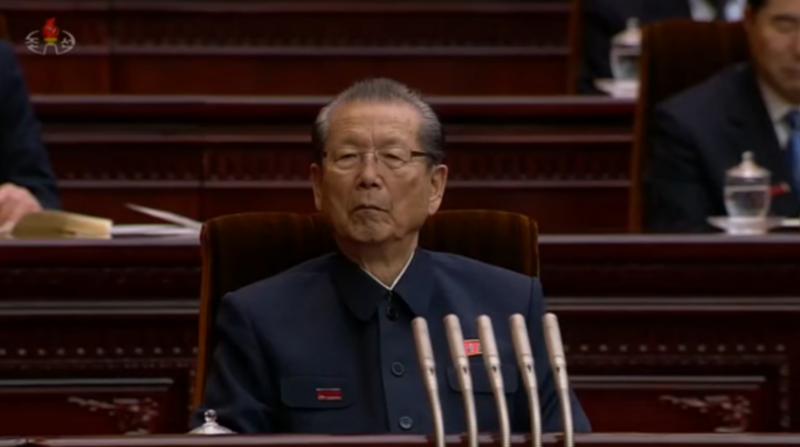 Minister of Finance Ki Kwang Ho reads out a report about the DPRK state budget during the sixth session of the 13th Supreme People’s Assembly on April 11, 2018 (Photo: KCTV). The local budgetary revenue plan was carried out at 100.5 percent. Last year the state budgetary expenditure plan was carried out at 99.8 percent. 15.8 percent of the total expenditure was earmarked for the increasing of the military capabilities of the country and 47.7 percent for the development of the national economy. Investment in the field of science and technology was increased to 108.5 percent as over the previous year, thus contributing to settling the scientific and technological problems arising in the economic development and to accomplishing the tasks for studying ultra-modern field. 5.2 percent more fund was allocated to key sectors of the national economy and for the improvement of people’s livelihood than the previous year, thus actively promoting the drive for putting power, coal, metal, chemical, machinery and light industrial fields on a Chuch’e basis and updating their production processes. In particular, it helped build a Korean-style oxygen heat blast furnace at the Kim Ch’aek Iron and Steel Complex and attain the goal of producing new type tractors and trucks. 2.6 percent more investment was made for the construction field than the previous year, while 36.3 percent of the total expenditure was directed to facilitating the building of a highly-civilized socialist power, thus contributing to the implementation of the Party’s policies of prioritizing the education and health care and to the development of sports and literature and arts. According to the report, the state budgetary revenue and expenditure for this year have been shaped in such a way as to carry out the five-year strategy for the national economic development. The state budgetary revenue envisages 3.2 percent increase over last year, of which the transaction tax, key item of the budgetary revenue, is expected to grow to 102.5 percent while the profits from state enterprises is expected to grow to 103.6 percent, to hold 85.3 percent of the total revenue. The income from cooperative organizations is to grow to 100.9 percent, the real estate rent to 101.8 percent, the social insurance fee to 101.2 percent, while the revenue from property sales and price differences is to grow to 100.5 percent and other revenue to 100.8 percent. The revenue from economic trade zones is expected to grow to 102.5 percent. The central budgetary revenue out of the state budgetary revenue stands at 73.9 percent which means that the revenue from the central economy holds an overwhelming proportion. Provinces, cities and counties are expected to balance expenditure with their own revenue and contribute lots of funds to the central budget. The state budgetary expenditure is to grow to 105.1 percent over last year’s. An investment in strengthening the independence and Chuch’e character of the national economy and improving the standard of people’s living will increase to 104.9 percent as against last year and thus relevant fund will go to 47.6 percent of the total expenditure. An investment in the field of science and technology will increase to 107.3 percent. Expenditure for the overall national economy including power, metal, coal, chemical and machine industries, railway transport, light industry, agriculture and fisheries will increase to 105.5 percent. The financing necessary for actively promoting the capital construction and further expanding the achievements of forest restoration campaign will increase to 104.9 percent. 5.9 percent more fund will go to the education field, 6 percent more fund to public health, 105.1 percent to sports field and 103 percent to literature and arts. 15.9 percent of the total expenditure will go to increasing the military capabilities for self-defense. This year also, lots of educational aid fund and stipends will be sent for the children of Koreans in Japan. The state budget for this year will be successfully carried out through meticulous organization of economic operation and command and thus financially back the building of a powerful socialist country. View of the SPA session from the platform (Photo: Rodong Sinmun/KCNA). The SPA passed the “report on the work of the DPRK Cabinet and the summing up of the execution of the state budget for Chuch’e 106 (2017)” and authorized the 2018 DPRK state budget. SPA Chairman Choe Thae Bok (Photo: KCTV). Yang Hyong Sop and Choe Thae Bok proposed several personnel changes. 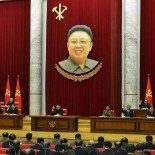 There were no changes to the DPRK Cabinet. However, Jong Yong Guk (Cho’ng Yo’ng-kuk) was elected Secretary-General of the SPA Presidium, replacing Hong Son Ok (Hong So’n-ok). The WPK Central Committee authorized the dismissal of Pak Thae Song from the SPA Presidium. Pak served on the SPA Presidium in the capacity of his former position as South P’yo’ngan WPK Provincial Committee Chairman; during the 2nd plenary meeting of the WPK Central Committee in October, Pak was elected a WPK Vice Chairman and member of the Executive Policy Bureau (formerly known as the Secretariat). Pak was replaced on the SPA Presidium by Pyongyang WPK City Committee Chairman Kim Su Gil. Also elected to the SPA Presidium were Pak Chol Min and Kim Chang Yop, representing their leadership roles on the Youth League and Agricultural Workers’ Union respectively. 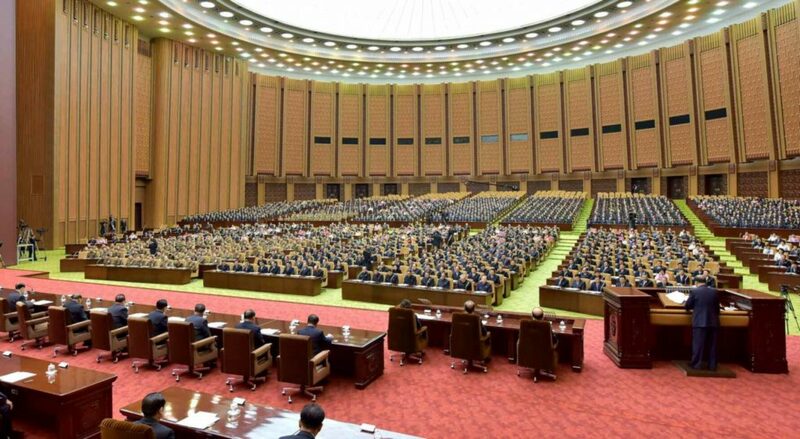 View of the SPA chamber at Mansudae Assembly Hall in Pyongyang during the 6th session of the 13th Supreme People’s Assembly (Photo: KCNA/Rodong Sinmun). On the SPA Legislation Committee, North Hwanghae WPK Provincial Committee Chairman Ryang Jong Hun (Ryang Cho’ng-hun) and DPRK Central Public Prosecutor’s Office Director Kim Myong Gil (Kim Myo’ng-kil) were elected as members. Kim is the formal replace for former chief prosecutor Jang Pyong Gyu (Chang Pyo’ng-kyu) who was removed from office last year. 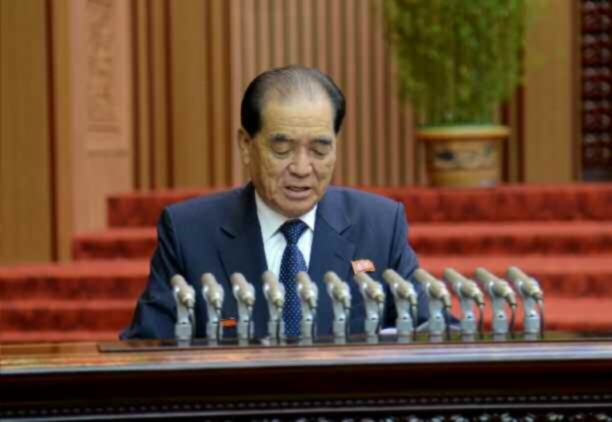 Ryang replaces Pak Thae Dok, himself the former party boss in North Hwanghae and who was elected a WPK Vice Chairman (likely for General Affairs) during the 2nd plenary meeting of the WPK Central Committee in October 2017. Former KPA General Political Department Director (second from the right) was removed as Vice Chairman of the State Affairs Commission reflecting his return to the central party apparatus. Also visible in this photo are Namp’o WPK City Committee Chairman Kang Yang Mo (left) and former WPK Propaganda and Agitation Department Senior Deputy Director Ri Jae Il (right) (Photo: KCTV). 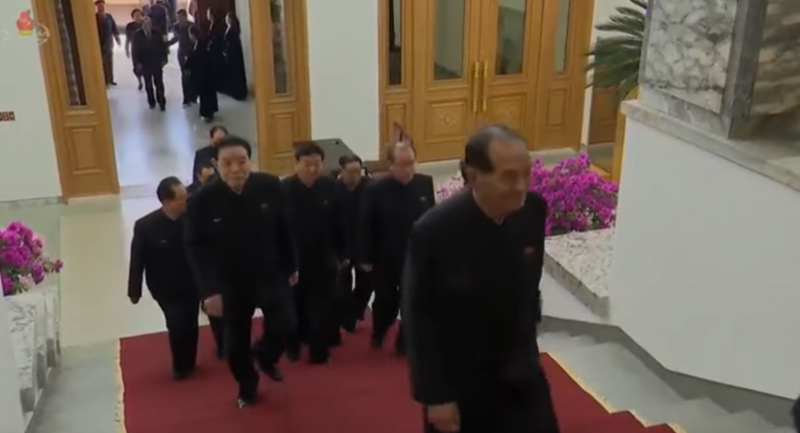 Finally there were three personnel changes to the DPRK’s supreme power and policymaking organization, the State Affairs Commission [SAC], which were proposed by the absent Kim Jong Un (Kim Cho’ng-u’n). 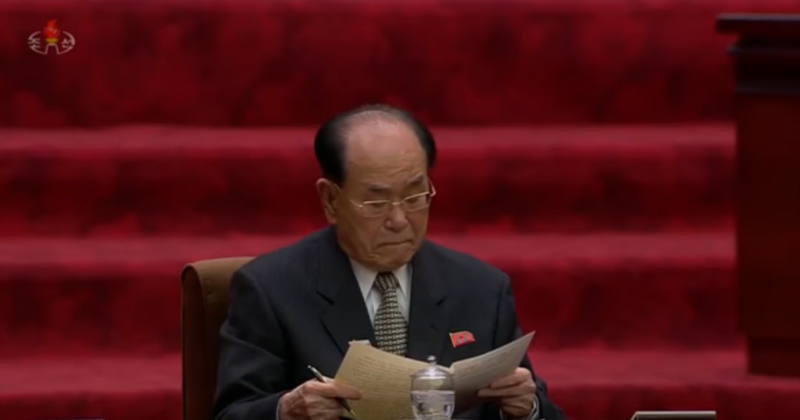 KPA General Political Department Director VMar Kim Jong Gak was elected a member of the SAC, replacing Hwang Pyong So. Thae Jong Su was elected a member of the SAC to replace Ri Man Gon. Jong Kyong Thaek was elected to the SAC to replace Gen. Kim Won Hong (Kim Wo’n-hong). This article was written on 14 Apr 2018, and is filled under 2018 Strategic Rhetoric, 2nd Academy of Natural Science, Agriculture Department, An Jong Su (WPK LID), An Tong Chun, Atomic Weapons Institute, basic party organizations, Cadre Affairs, Capital City Construction Commission, capital construction, Central Committee, Central Military Committee, Central Party Affairs/Cadres 5th Section, central party life, chemical facilities, Choe Chun Sik, Choe Hwi (PAD], Choe Jong Ryong [SHW WPK], Choe Ryong Hae, Choe Tae Bok, Choe Yong Rim, Col. Gen. No Kwang Chol (KPAGS), colonel general, Committee for the Peaceful Reunification of Korea, Committee for the Peaceful Reunification of the Fatherland (CPRF), Comprehensive Affairs, corps command, corps commanders, critical infrastructure, Democratic Front for the Reunification of the Fatherland, dprk attorneys, DPRK Cabinet, DPRK Central Bank, DPRK Central Court (Supreme Court), DPRK education system, DPRK Energy Policy, DPRK fishing industries, DPRK Legal System, DPRK Premier, DPRK Supreme Prosecutor's Office (DPRK Central Public Prosecutor's Office), Economic Complexes, Education Commission, Executive Policy Bureau, Finance and Accounting, Financial Planning Department, Five Year Economic Plan and Development Strategy (2016), food production, Gen. Choe Pu Il, Gen. Kim Won Hong, Gen. Kim Yong Chol, Gen. Pak Yong Sik (MPAF), Gen. Ri Myong Su, Gen. Ri Pyong Chol, General Affairs, General Federation of Trade Unions of Korea, gsd, Guard Command, Hong Sung Mu, Hong Yong Chil (KWP MBID), Hwang Pyong So, Hwang Pyong So (GPD; KPA VMAR), ideological slogans, Im Chol Ung (DPRK Vice Premier WPK PB), internal security, International Affairs Department WPK, International Department, Jagang KWP Provincial Committee, Jang Chol (State Academy of Science President), Jang Chun Sil (KDWU), Jang Pyong Gyu, Jo Chun Ryong, Jo Yon Jun (OGD), Jon Kwang Ho, Jong Kyong Thaek (State Security), Ju Yong Gil (GFTUK), Kang Jong Gwan (Minister of Land and Marine Transport), Kang Yang Mo, Kang Yun Sok, Kangwo'n Provincial KWP Committee, Kim Chang Yop (UAWK), Kim Family, Kim Il Sung Youth League, Kim Jae Ryong (Jagang WPK Provincial Committee Chief Secretary), Kim Jong-il, Kim Jong-un, Kim Ki Nam, Kim Ki-nam, Kim Kyong Ok (OGD), Kim Nung O (NPyongan WPK), Kim Phyong Hae (Cadres/NPYPPC), Kim Pyong Ho (PAD), Kim Sung Du, Kim Tok Hun, Kim Tu Il, Kim Ung Chol (NDC), Kim Yo Jong, Kim Yo-chong, Kim Yong Dae, Kim Yong Gwan (Metallurgical Industrites DPRKC), Kim Yong Nam, Kim Yong Su (WPK CC DD), kisyl, KJI Personal Secretariat, Ko In Ho, Korean Democratic Women's Union, Korean People's Internal Security Forces, Korean People's Army (KPA), Korean Social Democratic Party, Korean Workers' Party (KWP), KPA basic party organizations, KPA branch party organizations, KPA General Political Bureau, KPA General Political Department, KPA General Propaganda Department, KPA General Staff, KPA Organization Department, KPA Party Life, KPA supernumerary organizations, KPA WPK Committee, kpif, Kwak Pom Gi, Light Industry Department, local people's committees, Lt. Gen. Kim Su Gil, Machine Building Industry Department, Min Pyong Chol [OGD], mines, Ministry of Agriculture, Ministry of Capital Construction, Ministry of Chemical Industry, Ministry of Coal Industry, Ministry of Common Education, Ministry of Construction and Building Materials Industry, Ministry of Culture, Ministry of Education, Ministry of Electric Power, Ministry of Electronic Industry, Ministry of Extractive Industries, Ministry of Finance, Ministry of Fisheries, Ministry of Food and Consumer Goods, Ministry of Food and Procurement, Ministry of Foodstuffs and Daily Necessities, Ministry of Forestry Management, Ministry of Higher Education, Ministry of Labor, Ministry of Land and Environmental Protection, Ministry of Land and Marine Transport, Ministry of Light Industry, Ministry of Machine-Building Industry, Ministry of Metal Industry, Ministry of Metallurgical Industry, Ministry of Mining and Metallurgy, Ministry of Mining Industry, Ministry of Oil and Gas, ministry of people's security, Ministry of Post and Telecom, Ministry of Railways, Ministry of State Construction Control, Ministry of State Security, Ministry of the People's Armed Forces (MPAF), Namp'o WPK Committee, Navy Command, North Hwanghae Provincial KWP Committee, North Korean press, North Pyongan KWP Provincial Committee, O Su Yong, Organization and Guidance Department, Pak Chol Min [KISYL], Pak Jong Nam (Kangwon WPK PC), Pak Kwang Ho (PAD), Pak Myong Chol, Pak Pong Ju, Pak Tae Dok (N. Hwanghae WPK), Pak Thae Song (KWP CC Dept), Party elders, Party History Institute, party life, Party Life Guidance, Political Bureau, power plants, primary party committees, Propaganda and Agitation Department, Provincial Party Committees, Provincial Party System, Public Events, Public Information Commission, Publication Guidance Bureau, Pyongyang Defense Command, Pyongyang WPK Committee, Ri Chol, Ri Ju O (DPRK Vice Premier), Ri Man Gon (N. P'yo'ngan WPK PC), Ri Pyong Chol, Ri Ryong Nam, Ri Su Yong, Rim Kyong Man (Raso'n WPK), Ro Tu Chol, rural management committees, Ryang Jong Hun [NHWA WPK PC], Second Economic Committee, Second Economy Commission, Secretariat, South P'yo'ngan KWP Provincial Committee, State Academy of Sciences, State Affairs Commission, State Planning Commission (SPC), State Science and Technology Commission, State Security Department, Supreme People's Assembly, Tae Jong Su, uawk, Uncategorized, United Front Department, VADM Kim Myong Sik (KPAN), VMar Kim Jong Gak, water facilities, Worker Peasant Red Guard, Workers' and Social Organizations, WPK Economic Affairs Dept, Yang Hyong Sop, Yu Jin, Yun Jong Ho, Yun Jong Rin.